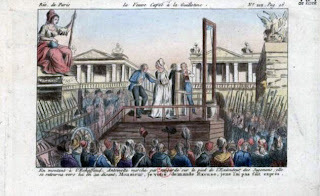 On this day in 1792, the guillotine was adopted as the official means of execution in France. bascule - A board with leather straps that tilted. The victim would rest their stomach against the bascule and be secured to it with leather straps. The bascule would then be tipped forward (think of a see-saw). In some cases, the anxious or combative victim would be secured to the bascule behind a curtain so they could not see the guillotine and then rolled forward. crossbar - The crossbar contained the mechanism that held and released the mouton. déclic - The wooden handle that the executioner would pull to activate the crossbar, which would release the mouton and blade. lunette - Two boards with crescent shaped indentations used for locking the head in place. The victim would rest their neck in the lunette. mouton - The heavy weight attached to the top of the blade. The mouton weighed approximately 66 pounds. tocsin - A bell that was rung before an execution. tumbrel - (sometimes spelled tumbril) A wooden cart used to transport the condemned from prison to the guillotine. Marie Antoinette rode in a common, unpainted tumbrel, while George Danton rode in a red-painted tumbrel. Louis XVI - (January 21, 1793) King of France. 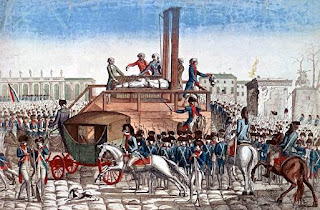 If you would like to read more about the final moments of Louis XVI's life, please read my article The Death of Louis XVI. Marie Antoinette - (October 16, 1793) Queen of France. By all accounts, the queen conducted herself with dignity as she mounted the steps of the scaffold, even apologizing when she accidentally stepped on the executioner's foot. Maximilien François Marie Isidore de Robespierre - (July 28, 1794) Influential leader of the Revolution. Ironically, he was a vehement proponent of the guillotine and mastermind of the Reign of Terror. 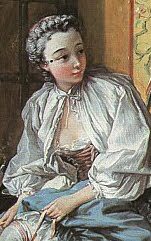 Madame du Barry - (December 8, 1793) Born Jeanne Bécu, this beautiful commoner would become Louis XV's mistress and Marie Antoinette's enemy. She enchanted the elderly king and many of his courtiers with her bold, outrageous behavior. Her boldness deserted her in the dark, cold final hours of her life. Unlike Marie Antoinette, her enemy, Madame du Barry did not climb the steps to the scaffold with dignity and courage. The struggling, over-wrought woman had to be carried to the guillotine. "You are going to hurt me! Please don't hurt me!" she screamed. Read about people who died at the guillotine. The condemned were often allowed to write a last letter to a relative or friend. Unfortunately, many of these letters went undelivered. A box of last letters written by victims of the Reign of Terror were found in an archive in France in the 1980s. Marie Antoinette's last, scribbled message to her children. Once the blade was released, it took less than a 1/10th of a second for it to slice through the neck of the condemned and come to a rest. 28 people were executed by guillotine before the Reign of Terror. 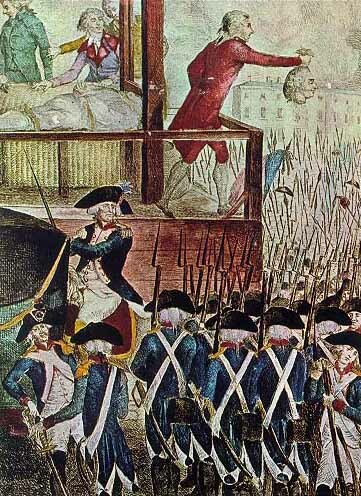 2,639 people were executed by guillotine in Paris during the Revolution. Estimates vary, but it is believed anywhere from 10,000 to 40,000 people were executed by means of guillotine during the French Revolution. 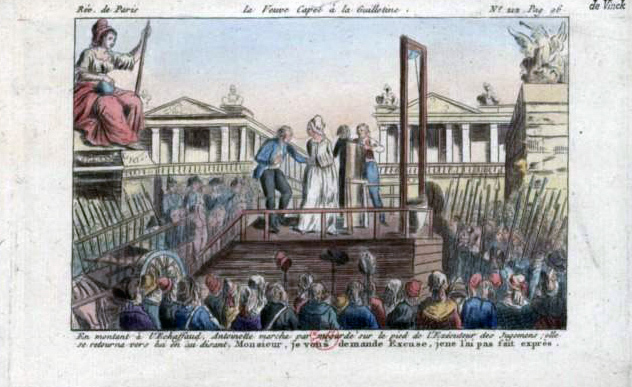 The last execution by guillotine in France occurred on September 10, 1977. 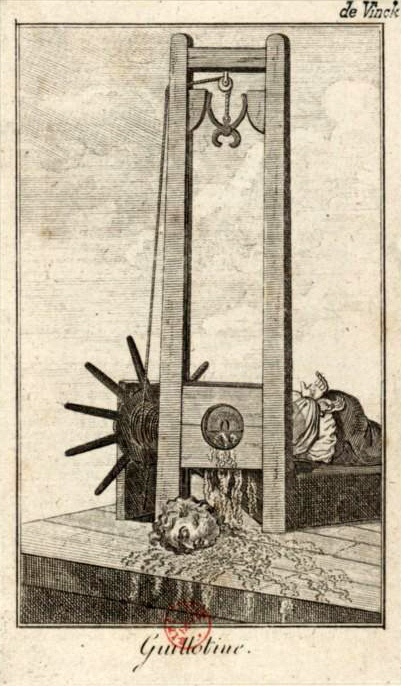 The youngest victim of the guillotine was only 14 years old. 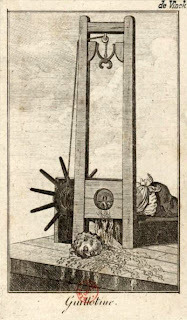 Mary Anne Josephine Douay was the oldest victim of the guillotine. She was 92 years old when she died. 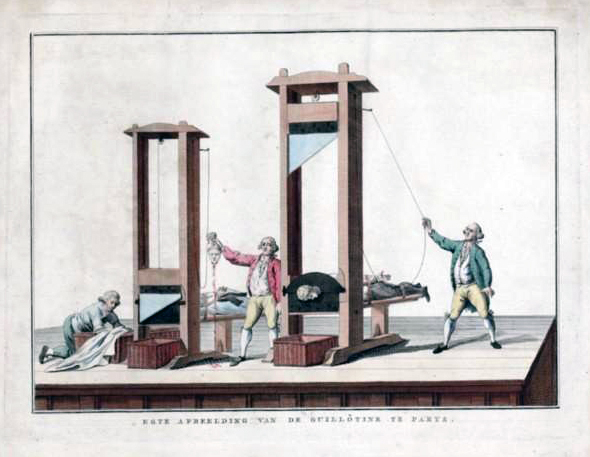 Although the machine was named after him, Dr. Joseph Ignace Guillotin did not invent the guillotine. Outraged at the brutality of public executions, the doctor was a vocal advocate for humane forms of capital punishment. Highwayman Nicolas Jacques Pelletier was the first person to be executed by means of the guillotine. After the head tumbled into the basket, the executioner would hold it aloft for the crowd to behold. Sometimes, the eyes or mouth would open and close, terrifying the crowd. One condemned woman tossed her infant to someone standing in the crowd just moments before lying on the bascule. Hitler was a fan of the guillotine and had several constructed. 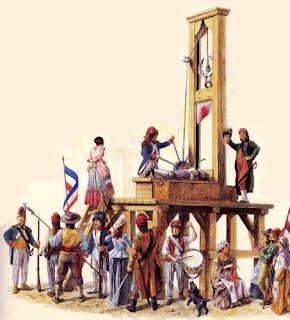 It is believed over 15,000 people died by guillotine during Nazi rule. Very interesting fact about the Guillotine...I cannot believe how late into the 20th century it was used, incredible! real great study aid, thankyou.